Pretty Little Liars Thank you for Netflix because while others had to wait 5 years for the whole A reveal I watched 6 seasons and was up to date before the A reveal in about 4 months. After finishing Gossip Girl I knew I wanted to either watch PLL or Once Upon A Time and I'm so glad I choose Pretty Little Liars because I am obsessed! Yes I was disappointed with the A reveal and kind of half expected it to be who it was so it wasn't all that amazing. However that does not mean I'm in any way less excited for it to be back in January, I cannot wait! Find Your Zen Jewellery* I really adored wearing the necklace and midi rings throughout August, I'm all about dainty gold jewellery and so these were just perfect for my liking! They are also super affordable too and you can read more about them in my blog post here. Salted Caramel Candle I'm pretty sure I included this in last month's favourites also but I just absolutely adore it. I have it lighting constantly and it just smells divine. I have about 1/3 of it left but not to worry as I have a brand new one waiting to take it's place. Gotta love some Salted Caramel! Sanctuary Spa Feather Light Moisture Spray Something that I picked up at the start of the month was this little gem and I am so in love with it. It leaves your skin feeling fresh and moisturised and I honestly cannot get enough of it. You can read my full review on this gem here. L'oreal Blakes Red Lipstick During August my obsession for red lips came back and I basically wore this every day. I absolutely adore the pigmentation and it has decent staying power however I'd use it with Lipcote which would help it stay on for hours! Lipcote review coming soon. Treacle Moon Dusted Cocoa Heaven Shower Gel I won this on Twitter for their Monday giveaway which they do every day and when I received it in the post I was over the moon that they sent me the Cocoa one as I adore Chocolate! This smells absolutely amazing, like you are literally bathing in chocolate and I cannot get enough of it. If you're a chocoholic trust me you need this in your life! 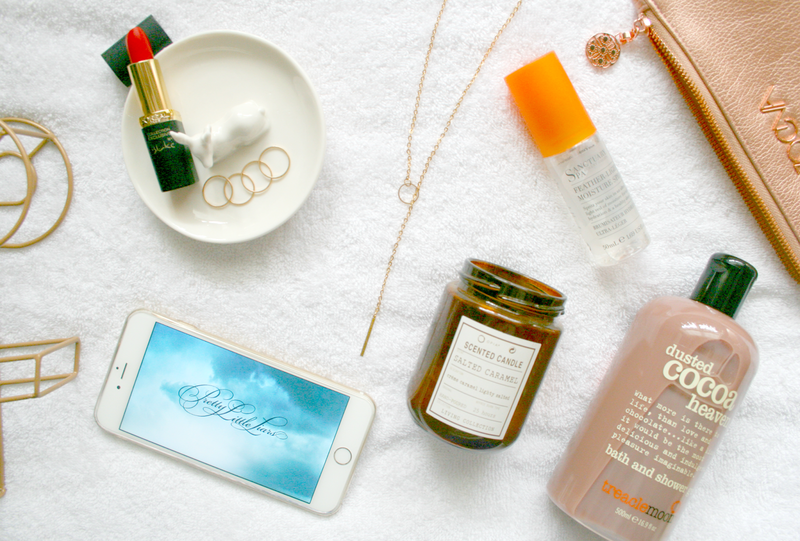 What made it into your August favourites? Great post! I also watched PLL on Netflix this summer. Such an addicting show! that salted caramel candle sounds amazing! PLL are everything!!! I absolutely agree that the finale was i bit dissapointing, but i cannot wait to see the rest!! The Sanctuary spray is amazing isn't it?! It's always in my hand bag and gives your skin the most amazing shine! Definitely a keeper!